It’s difficult to continuously come up with a fresh newsletter idea that can engage your audience. We all have experienced ‘newsletter writer’s block’ syndrome. Yep, it affects the biggest and baddest newsletter creators. If you are looking for fresh newsletter ideas or curated newsletter ideas, you are in luck because we have 30 great newsletter ideas for you to spruce up your newsletter! Hit the Pause Button: Why are Email Newsletters So Important? Email newsletters are a great way to maintain an ongoing relationship with your audience so that you stay on top of their minds. The best part is that customers love getting these emails. In fact, 72% of U.S. adults prefer communication with companies via email. When someone subscribes to your newsletter, it is the surefire way of knowing that your audience likes your products or services. Newsletters are a great direct marketing approach to continue to engage and grow your reader’s interest. Keeping your subscribers engaged with your newsletters is the real challenge. The number one way to increase your newsletter subscribers interest is by providing them with interesting and useful content, consistently. Don’t worry we have compiled a bunch of awesome newsletter ideas that will help you think creatively and increase your audience engagement levels. Get ready to start pushing out great newsletter content consistently without missing a beat! We highly recommend that you bookmark this blog post and anytime you find yourself in a ‘creative rut,’ you can come back and get your dose of newsletter inspiration. Sharing industry news is one of the most popular types of newsletters. It involves researching and collecting content from various sources within your niche. The sources you’re curating information from. Adding your unique commentary and perspective of why each piece of news is important. The overall message or story you are conveying for each newsletter. Industry newsletters helps you to be looked at as a thought-leader. By providing a unique perspective of your industries news, you become a significant voice for your readers. You have the power to help them think, behave and act differently as a result of the information you’re sharing. Example: A tech blog sends out weekly newsletters that covers new product launches, acquisitions, market research, new releases, new laws, etc. Pay close attention to catchy headlines and make your visuals appealing to increase your audiences interest in your newsletter. As long as your curated content is unique and your readers haven’t been exposed to your recommended reads, then get ready for increased engagement levels! These curated newsletters can cover a wide range of topics from finance, self-help, fashion, technology and more. You can include editorials, books, e-books and other digital types of content to provide your audience with various sources of information. One of the best ways to continue staying in touch with your clients without calling or sending them personal emails is to send an informative newsletter. Newsletters help you to keep your clients in the loop with the latest updates in your organization, updates with your product, and your research, etc. It helps make your customers feel valued and know that your organization is on top of its game. The more confident your customers feel with your perspective and organizational developments, the stronger your relationship will become. Example: A food packaging company, shares information on the latest packaging trends along with examples that showcase how they implemented the latest designs. Sending a regular internal newsletter is a smart way to keep everyone in your organization up to date. By sending out newsletters, you are ensuring consistent messages across teams and departments regardless of their physical location. It’s an important way to share company updates, press, perspective on the industry, etc. The information you share relays what’s important to the organization. Sending regular newsletters is a great way to supplement all-hands meetings and keep the organization running in unison towards the same goals. Keep your internal newsletter reflective of your brand and culture. It should be fun and engaging, but at the same time balanced with your business and communication goals. Example: You can share company achievements, motivational content, latest trends, progress about your upcoming products, new policies, etc. Resource newsletters are a great way to help your reader find a breadth of information on a topic without having to put in the research time. Think of topics that are meaningful to your audience, and that can help them create shortcuts in their day, streamline their work processes and share information they’ll want to reference over time. You want to think of including information that will make their lives easier. These types of newsletters will get forwarded on and ultimately help you grow your audience. Example: A content marketing influencer creates a newsletter titled “How to Win at Content Marketing” and includes YouTube videos, relevant blog posts, and tools required to win at content marketing in the form a well-curated newsletter. Educational newsletters will help you showcase your expertise and knowledge. If your readers enjoy learning new skills and information, this is a great medium to use to engage them. The internet is filled with how-to tutorials, e-books, case studies, YouTube videos that teach and inspire. Figure out what your readers enjoy learning about and put together a curated newsletter to teach them. There are a plethora of interesting things to learn about your product, industry and the world in general. Example: If you run an online fashion store, teach your audience how to style clothes, how to accessorize, how to creatively wrap scarfs, etc. If you run a blog, your audience subscribed to your email list because they enjoy your writing and the information/perspective you share. One important way of making sure you drive traffic to your site and help your readers find interesting information on your blog is through a blog round up newsletter. You likely have written about various topics within your industry. Start compiling blog posts on a specific topic and share them with your readers. You can even compile top blog posts of the week, etc. It’s a smart way to repurpose your existing content and make sure you engage your audience. You’ve developed your audience as a result of you, your work, your product or your service. It’s important to humanize your interactions and help your audience feel close to you. Email newsletters are a great way to show off your personality and help increase engagement levels. You can share encouraging motivational quotes for your industry and niche. Funny memes and jokes can also help your followers remain engaged with you. Depending on your industry you can share humorous articles and videos that your audience can relate to. Make sure the entertaining newsletter that you create, doesn’t become offensive. Ultimately you want to grow your user base not shrink it! Example: Add a weekly horoscope, funny meme or quote of the day in one segment of your newsletter to make it more entertaining. Newsletters can be used as a tool to help you collect valuable customer information with a friendly poll or survey. You’ll want to keep your survey/poll short and to the point. One way to encourage audience participation is by entering them into a giveaway if they complete it within a certain time period. The survey topic can help you with your newsletter by asking your customer what type of information they would like to receive. It can also be about your organization, service or information to help you conduct research on your audience. It’s important to make sure that your audience feels that they are helping you, but that they are also getting something out of the questions (i.e., like learning the results of the survey, winning a prize, better newsletters, etc.). Example: A startup in the SaaS space asks it’s audience questions to help them conduct research. The research in turn will be used to fine tune their application and provide a better experience for their clients. Product update newsletters are a great marketing tool to keep your audience abreast of awesome changes. Every product and service has to evolve over time, and the more you keep your customers in the loop with those changes the more they will value you. Everyone wants to work with a company who is innovative and is constantly improving. Showoff your thinking and improvement. Explain how those changes work and why they are important for your customers. You get to show the customers that you care about them and their evolving world. Sending product update newsletters is a great way to remain relevant in the eyes of your customers. Example: An organizatio is rolling out a beta product and emails their customers to give them early access. 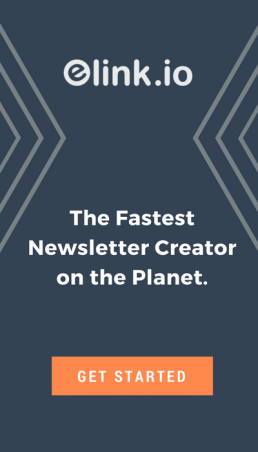 This newsletter will make their customers feel special and create pre-launch buzz. Sending product deals and offers through newsletters is a great way to encourage your audience to purchase and upgrade. It’s a smart way to increase your sales, and often these types of newsletters get shared and spread through social media. It really can help you generate more leads as the deal is passed on. Make sure you include a timeline to encourage your audience to act quickly and don’t forget the most important part…show the benefit your audience will receive from the deal. Example: A spa has a deal on Groupon, and they let their customers know that they can take advantage of it for a limited time before the opportunity is gone. Sending a newsletter doesn’t have to be educational. An important way to humanize you and your brand is by sharing your victories, milestones or just celebrating your anniversary with your loyal customers and subscribers. It’s a smart way to build a sense of community amongst your customers and the brand. Your audience is an integral part of your brand’s success and should be made to feel that they are there helping and cheering you along. Example: A social network sends out an email celebrating that they acquired a new augmented reality startup that has an amazing camera feature that will be integrated into their platform. Heads of companies have an awesome opportunity to humanize their brand. Receiving direct messages from CEOs to employees and customers is extremely important. It helps customers feel that they have direct access and line of communication from the top. It’s the most important voice coming from a company. Sending regular newsletters that contain messages from the CEO will help strengthen the bond your customers have to your brand. Messages can include thank you messages, goals for the coming years or snippets of upcoming products and vision for the future. Example: CEO of a money management firm provides a quarterly update to her clients letting them know their investment projections for the next quarter. All companies get questions that come up more often than others. Those patterns start to appear over time. Stay ahead and answer your customer questions before they ask them. Help them understand your company, product features, service upgrades and more with a FAQ newsletter. It’s a great way to help your customers who may be wondering about a feature, but just haven’t taken the time to ask you. Your FAQ newsletter can include questions you receive in emails, in app chats, during demos, on your blog or social media. This is a strategic way to help your customers succeed and reduce the redundancy of similar customer care email requests. Example: A medical device company receives the same set of questions from doctors who use their latest device. They put together a FAQ newsletter series so that the doctors & patients can get the most out of the device and remain loyal customers. Newsletters are a great way to entice your audience to engage with you by sharing important information you have created. It can be white papers, PDF presentations, e-books, etc. This material can truly serve your audience and help them look at you as a resource and expert in their industry. Content heavy resources show your in-depth knowledge and help you gain the trust and following of your audience, customers, and prospective customers. Example: A fitness guru put together a DIY six-week exercise course that her followers can do at home. Sharing newsletters that contain great success stories can convert prospects into real customers. Existing customers can become inspired to share your stories and act as your greatest references. Stories help audiences relate to you, your brand, product, and service. When a use case is shared, customers can be made to feel that their goals are aligned, and they too can find solutions with what your company provides. Example: An architecture firm shares the latest project they worked on, but instead of it coming from their voice, they had the customer share how it was working with their firm. Internal newsletters are a great way to train and onboard new employees and get them up to speed with your organization and their jobs. By creating standardizations onboarding and helping new and existing employees learn about their jobs and changes in the company, it’s a great way to make sure everyone is working towards a common goal. Onboarding newsletters can help with frequently asked questions regarding the organization, employee policies, reporting hierarchy, a brief history of your organization, case studies, product how-to videos, help center articles, etc. Example: A fashion house can share updates in the workflow to ensure that they can meet their deadline for next seasons looks. Sending out an email newsletter regarding a training course is a great way to generate new leads. It’s a smart way to offer special informative information in exchange for a prospects email and grow your user base. It’s also useful to engage and increase retention rates of existing customers by adding value to the relationship. Free training helps customers feel they can trust your brand to stay on top of the changes and challenges within your industry. Offer courses on topics that are directly related to your niche in order for you to assert your knowledge and gain credibility. Follow up during the duration of the course and provide additional resources and information to maintain your audiences engagement levels. Example: Educational technologist creates an online course to help teachers bring tech into their classrooms. She sends out an email letting her audience know the time and date the course will start, what will be covered and the amount the audience would need to pay to participate. Newsletter Idea #19: What’s Hot! Sharing newsletters around ‘What’s Hot’ is a great way to create a viral newsletter. The key is to be able to curate content well enough so that it’s interesting and entertaining. What’s Hot content can come from trending news stories from social media and around the web. You can also leverage this newsletter to add some of your own content to mix it in. Share a curated newsletter on a topic that keeps your audience up to date with what’s happening in the real world and digital world! Example: A social media influencer shares the funniest content from his peers and includes his own content as well. It’s a great way to show that he’s one of the best and encourage more subscribers. Did you know that infographics are liked and shared on social media 3x more times more than any other type of content? They surely make compelling content and add a bit of flare to your newsletter. Creating visual newsletters is a great way to encourage engagement and interest. Your infographics can include stats about your company, product or industry. Make sure to include infographics that your audience would find interesting and something that would cause them to share it. Example: A design firm sends out a newsletter that includes an infographic that explains how their audience should pair fonts together. Did you know that 88% of consumers say that they trust online reviews as much as personal recommendations? Customers trust each other and thus, including positive customer reviews about your products or services in your newsletter can help establish credibility and drive more sales. It’s a great way to convince prospective customers that you have the best solution to their problems. It also helps existing customers to rave about your product with their similar experiences. Example: A company makes tech apps for kids. By including reviews of the paid version of their app in their latest newsletter, they saw an increase in upgrades by existing users. Newsletters are a great medium to promote your upcoming event, trade show, product launch, or sales events to your customers. When there is time sensitive communication, newsletters are a great way to share these announcements and get your audience fired up. Use visuals to make your newsletters pop and be memorable. Share all the relevant details they need to participate, like directions, coupon codes, ticket prices, parking, etc. Example: A manufacturing company is going to participate in trade shows in multiple cities around the world. They send a newsletter out to their customers and prospective customers letting them know their schedule. Sending newsletters that share the behind the scenes fun of your organization is a great way for your customers to connect with you and your brand. Providing them with a sneak peak into the office environment, sharing a recent company event, upcoming product images, etc. will make your company be memorable. People love seeing what’s really going on behind the scenes. By sharing a few of the internal workings of your organization, it will make your subscribers feel like they are an extension of the organization. Example: An interior design company sends a holiday newsletter that includes an image of all the employees wearing elf hats and celebrating the holidays together. Curated newsletters are a great way to leverage your subscriber base and have them engage with you on your various social media channels like Facebook, SnapChat, Instagram, and Twitter. Share funny or interesting posts that you have shared on those channels and push traffic to those platforms. The more engagement you receive from your customers across social media platforms and email the stronger your bond will be. Make sure to always include links to your social media accounts and websites. This helps in cross promoting your brand and be on customer top of mind wherever they are online. Example: A makeup company shares Instagram posts of makeup artists loving their products and creating making up tutorials using their brands makeup. It’s important to keep your team motivated and looped in with the changing dynamics of your industry including changes with your competitors. Help your team make better decisions by being open and alerting your team of new features, investments, updates, mergers and acquisitions of your competitors. The information you share shows your employees what you think is important. That can be either an opportunity or a threat. By curating a newsletter, you’re able to provide the direct source of information in the press, etc. Example: A trendy all-natural grocery store is making headways and looking to add another store in a city with an enormous market opportunity. The leading all-natural grocery chain just announced that they would be adding five new stores in the same city. The executive team sends out a curated newsletter on the topic and helps employees understand that they are moving ahead and there is more than enough opportunity for both chains to capture the market. Business can curate newsletter around the different kinds of press they have received. They can share this information internally, with partners and clients. This can help brands understand how they are being perceived by the press. They can repurpose positive press and use it for marketing purposes. These press related newsletters can be sent on a daily, weekly or monthly basis depending on the importance and amount of press you receive. Example: A PR firm curates newsletters of press they have achieved for various clients they are working for. They share these newsletters internally, with their clients and prospective clients. Sending a newsletter about a giveaway and contest is a smart way to increase audience engagement and encourage your readers to perform an activity. You can create giveaways around brand promotion, surveys, feedback or encourage sharing the brand with friends/colleagues. This is an opportunity to be creative. Make sure you understand your audience well enough to understand what they would be willing to do for what level of prize. This is a great way to grow your subscriber/customer base as they share your giveaway with their communities and network. Example: A private jet company provides a charter service for a monthly fee. They created a contest of their current customer base to share the company with their networks. In return, they offered one lucky winner a year of unlimited chartered flights for free. Sending your latest newsletter blog posts is a great way to remind your customers about the awesome content you have been publishing on your website. They may have missed some of your content, and it’s always a great idea to alert them when new content is added. Include a curated newsletter that includes visual links to drive traffic back to your website. You can do this on the day your new blog posts are uploaded, or you can compile them at the end of the week and include only the best blog posts. Example: A sales guru has a following on social media and her blog. She and her editorial staff write a lot of content every week. They send a weekly roll-up of the most popular articles of the week to help their audience who might have missed some of them. Conduct interviews of your industry leaders and share their knowledge and expertise with your subscribers. This is a great way for your audience to gain valuable insight from individuals they respect and follow. By creating and sharing new information with your subscribers, they can learn but from a new voice. It also makes you look to be very connected and important. You can interview industry celebrities, up and coming players, thought-leaders,etc. Example: A popular human resource app likes to conduct weekly interviews with human resource experts from fortune 500 companies and share the interview via their newsletter. Including a quiz in your newsletter is a fun way for your readers to engage with your content and feel they can learn something about themselves. Have fun with this and ask your readers to give you answers on your social media pages. This will help promote your social media presence. You can even offer free goodies to maximize engagement and increase open rates. Example: A popular publisher pairs up with an advertiser and sends a quiz out to their audience. Audience members have to respond with what their results were by sharing an Instagram photo and tagging both brands. Newsletters are a great way establish a genuine relationship with your subscribers. Did you know that on an average, 269 billion emails are sent every day? In order to not get lost in your customer’s inbox, you have to provide real value that your customers simply cannot ignore. 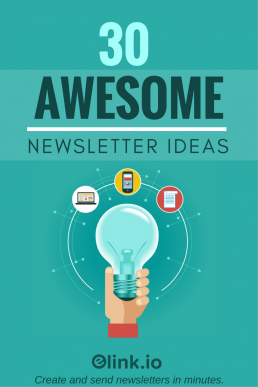 With these 30 newsletter content ideas, we are confident you won’t run out of awesome ideas! Have new newsletter ideas that we haven’t included? Share with us in the comment section below. Don’t forget to bookmark this page and come back whenever you need awesome newsletter inspiration! Wow fantastic list! Thank you! I am totally overwhelmed by the idea of sending out a newsletter. This really helped thank you for posting this. Such a great blog and you way of writing about the use of newsletter is fantastic. These are all great ideas! Giveaways and contests work particularly well for bloggers. I have bookmarked this for future use! I am not quite where I want to be in regards to starting a newsletter but I am getting there! Just pinned this for future use. You are really thorough and this list seems complete. This is really informative, sharing this surely helps lot of readers. Ideas like this helps on boosting creativity. Among newsletter my choice as reader is giveaways and contest. I’ve been thinking about creating a newsletter for AGES. Thank you for all the tips!!!! SO helpful. I agree that newsletters are important but sadly some of them are really annoying. You have a great list there and pointed out some interesting facts. Newsletters are something I struggle with so much so I really appreciate your tips! This is just what I needed! I just started a blog a few months ago and wasn’t sure if I should send out newsletters and what should be in them 🙂 now I have lots of ideas! Thank u!!! Great suggestions. I have been trying hard to make sure my emails either provide value, something to make them feel special, entertainment or knowledge. This is something I need to work on for my blog – to build a sizeable subscriber list. It would be nice to have regular readers and sending them email updates using a newsletter format would be so great. Thanks for this informative post. I really need to revamp my newsletter even if it’s just my RSS feed. Getting my posts out there is key and it is a great way to eventually send my subscribers special deals. Nice tips on sending out the newsletters! This is really informative. I agree that newsletter is very important. You had a great list. I will definitely sharing this will helps lot of readers. Great ideas. Pinning to use for later.